Activities at the Blackmith Shop. It started in 2012 with a group of energetic volunteers headed up by Bob Gordon to build a blacksmith shop by moving an old farm shop to the Lorain County Fairgrounds. It took about 2 years from laying the first sandstone foundation block to completion of the building. Bob Gordon and Matt Richards busy laying brick while John Temple and Tom Burrington clean the brick. 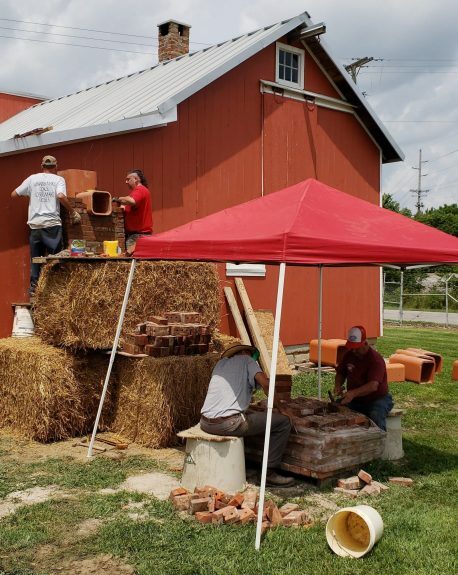 A second chimney at the Blacksmith Shop was completed in time for demonstrations at the 2018 Fair. This chimney was built to vent multiple items like a gas engine to run the line shaft, a stationary steam engine, another forge, or maybe another wood stove. This is in preparation for the expansion of the shop. The mansonary crew that was headed up by Bob Gordon was Bob Bauman, Bill Burkart, Bob Schworer, Tom Burrington, John Temple, Mark Diederick, Keith Enoc, and Matt Richards.